Perfect Location in the Port & walk to Bank St. Beach! 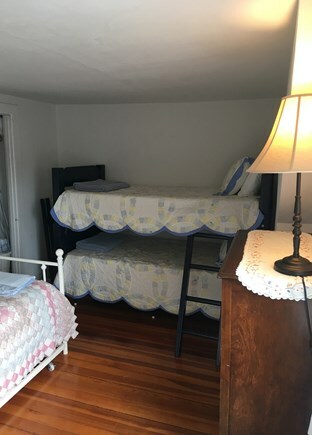 Upstairs w/4 twin beds. Bunk beds & day bed with twin trundle. ''in town'' view from driveway. Steps to main st & vacation fun! Easy 5-10 min walk to 2 beaches! 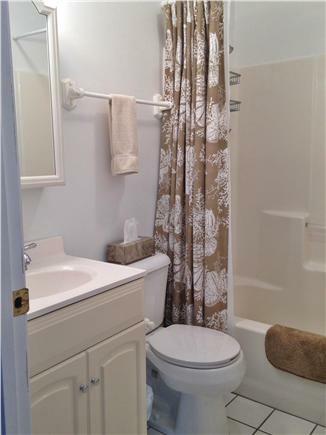 Looking to be a short walk to the beach and be in Harwich Port center? 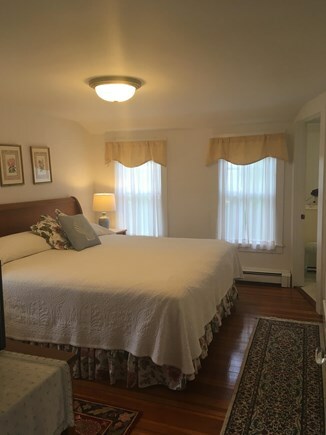 We are a 5-10 minute walk to 2 beaches(Bank St(8-10)or Sea St(5-8) beaches) and being ''in town'' you would have immediate access to many great restaurants and shopping being one house off rt 28 puts you in the heart of town activities. This lovingly restored antique built in 1900 is set back from Main St. but is just steps away from the beaches and even fewer steps from all the town has to offer and yet you can enjoy being in a completely private area in your back yard or deck. You will hardly need a car once you arrive at this unique 4 BR 3 BA home until it is time to leave. The main floor has one bedroom with a queen for a couple or someone who would rather not climb stairs. There is a full bath with a shower/tub combo next to the bedroom. Upstairs are three more bedrooms and two full baths. The master has a king size bed and a private bath with walk-in shower. 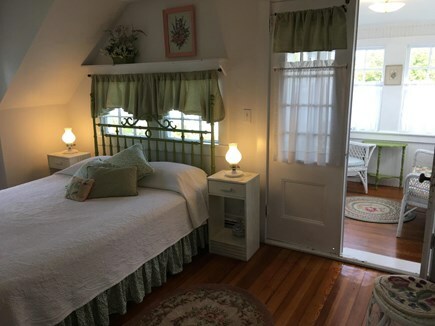 The queen bedroom is extra special with an attached enclosed private porch for reading or relaxing. The third bedroom has four twin beds (bunk beds and day bed w/twin trundle) and there is the comforts of A/C in each of the 4 bedrooms. The upstairs shared hallway bathroom has a combination shower and bathtub. There is a remodeled fully equipped kitchen with a dishwasher. 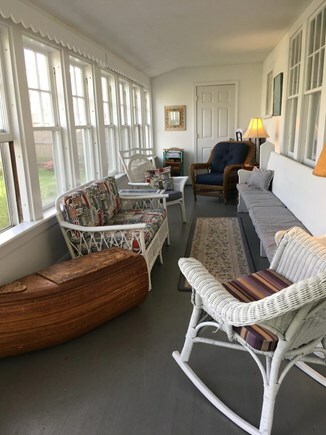 Enjoy a cold drink on the enclosed front porch, wifi internet access and high definition cable tv, washer and dryer and in back a lovely private deck and yard for barbecuing. There is also an enclosed outdoor hot/cold shower to wash off the sand from your day at the beach. 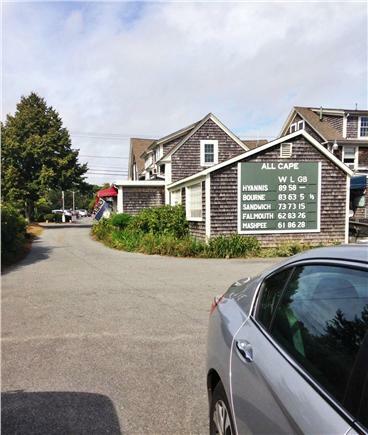 Walk to the many great restaurants and shops and if you are craving ice cream to Sundae School (only 1/4 mile), one of the best homemade ice cream shoppes on Cape Cod or take a quick 5 minute car ride to Bud’s Go-Karts or Trampoline Center in West Harwich! There is parking available for the Cape Cod Rail Trail behind the Congregational Church in Harwich Center. No Smoking And No Pets Please. Weekly price includes cleaning. Linens such as bed sheets, bath and beach towels not included. 4 car max parking. Gravel driveway has room for 2 cars and 2 deeded parking spaces in front parking lot. Follow us on Instagram @capecodrental for additional pictures and posts to see what you could be enjoying too! Additional pricing info: Cleaning fee included in rental price. State and local taxes of 12.45% will apply. First floor bedroom and full bath. Not wheelchair accessible. This is our 2nd year at this home in Harwich Port and we had the same great experience as last year. The home was clean and organized and supplied with all the required necessities. The rooms are spacious and the house has a great flow to it which makes it easy for the members of the family, including the grandchildren. Beds are great in all the rooms and plenty of bathrooms. The location to the town and the beach is perfect. Literally took the cars out very few times since you can walk easily to the beach and to some great local restaurants. The owners are great to deal with and information was passed back and forth easily. Very clear on the payment expectations, timely on feedback, and always available to assist if need be. Phone numbers supplied for easy means of communication, despite the time of the day. We had another great experience and look forward to vacationing there in the future. We were happy again to have you once again in our home. We appreciate having families like yours who care for our home as much as we do. We are happy to see how much you liked our home, its location and hangout spots. The village of Harwich Port gets better and better every year. We are looking forward to seeing how the new complex next door turns out! We look forward to hosting you in our hidden gem again next year! Enjoy the rest of your summer. We had an amazing week at this home! The house is in a perfect location! Quick walk to Bank Street Beach and right in the middle of all the restaurants. Homeowners were easy to deal with an super helpful. Thanks so much, Bob! Hope to see you back again next year and enjoy he rest of your summer. Just came back from a fantastic week spent at this rental. We were a party of 9 and the house was the perfect size with tons of living space and comfortable sleeping arrangements for everyone. There was even a fold out cot that we didn’t need. We split the week both eating out (there are a ton of restaurants within a short walking distance) and eating in (house is well stocked with everything we needed). Owners provided movies, games and a lot of beach equipment including a beach cart which was pretty handy. So glad you had a fantastic week! We do our best to make our guests comfortable in our home. We love the location too and are always pleasantly surprised at how private our backyard is with the house being “in-town” and just steps to the beach, restaurants and shopping! What a great location for our family vacation! At first it seemed a bit strange because the house was off the street, behind a few small local businesses right in Harwich Port. But this ended up being better in terms of a quiet location so close to all the action. There were 2 beaches within walking distance, and our kids loved them both. It was great that we could walk out the front door and have all the conveniences of a Cape town, and also be so close to nice beaches on the ocean side. We just want to say what a wonderful experience we had while staying in your home on Main Street in Harwich Port. 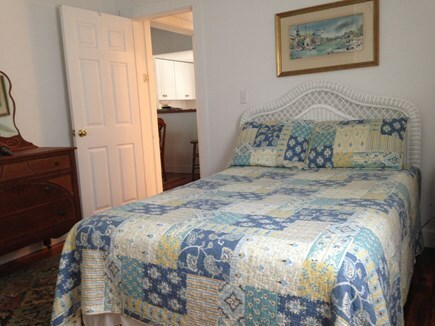 The location was excellent with easy access to the beach, restaurants, and town activities. The home was very clean, well stocked, and extremely organized. The rooms were good size and accommodated our family comfortably. Our stay was a wonderful experience, and we would return in the future. Thanks for contributing to a great family vacation. The best part about this rental is the location of the home and adequate amenities and space for 8 adults. The home was well kept and designed interior and lovely outside space. We would have liked an ice maker but a quick walk to buy ice from liquor store. All in all an excellent property. Our family of six adults and three children had a wonderful vacation at this property in Harwichport. Your home was very clean, spacious and has a warm and comfortable atmosphere. There were so many extras available to us - beach chairs, cooler, umbrella, beach cart, games, movies - to name a few. The kitchen has everything we needed and the washer/dryer was a bonus! We are so happy you enjoyed your stay in our home and the extras we leave for our guests. We also love our location especially during the very busy summer season when walking is preferable to driving along Route 28! Your home is beautiful--very spacious, lots of room, very tasteful, stately decor. 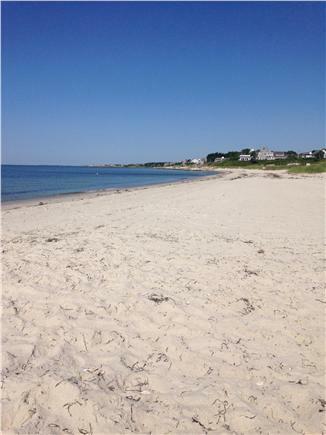 Just a brief walk to a terrific beach, and steps away from Main Street. We had a terrific time and would love to return! We had a great vacation last week. You have a beautiful home in the perfect location for us to explore the cape. We loved the local places in Harwich Port. Exactly what we were looking for. Music at Perks was great. What a gem to have so close. We also enjoyed Hot Stove, Ember and Sundae School ! We couldn't have asked for a more perfect beach week. I vacationed at the Cape as a little girl for 2 weeks every year, and then my husband and I continued the same tradition with our family and extended family. We knew we needed something large enough to accommodate lots of company. We also wanted a perfect location to be able to walk to the beach or into town. We purchased our home January 2015 after a huge Cape snowstorm! Entering the long front porch to see the oversized antique front door with brass knocker, I couldn't wait to see the inside. The home has original fir wood floors and rope style windows, most still have the antique wavy glass! The living room and dining room are open and comfortable with high ceilings. The house has 4 good size bedrooms and 3 full baths. One bedroom is on the first floor with a full bath next to it for older people or someone who would rather not climb stairs. 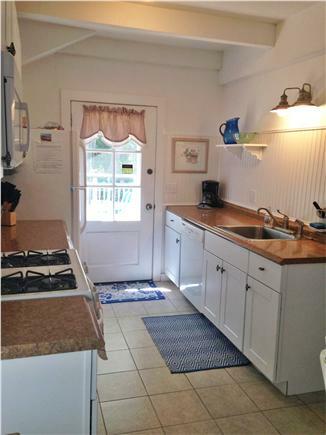 The galley kitchen is updated with plenty of cabinets and is fully equipped with most everything we need. There is a deck in the backyard and an outdoor hot/cold shower. There is parking for 2 cars in our driveway and two additional reserved spots in the front parking lot. Our family loves the location to be able to walk to 2 beaches and to all that Harwich Port has to offer understanding that being ''in town'' is not as quiet as being on a side street. We have tried almost all the restaurants within walking distance and have not been disappointed. We will make many happy memories in our new old home! Harwich Port is transforming into a fun and exciting little Cape village. It's close to beaches, has great restaurants and boutique style shops. The Cape Cod bike trail is very close by in Harwich center. During the summer months, there is always something going on ''in town''. Music in the Port on Wednesday nights(6pm-9pm) is fun drawing many people to listen to local musicians playing music along with shops open, local vendors selling merchandise up and down Main St. Many restaurants have outside entertainment from 5-10pm. Perks has a firepit, bar and live music(until 10pm) outside at night. Ember Pizza just 1/4 mile down the road also has a firepit, outside bar and music(until 10pm) to sit by at night. Kids will love the go carts, trampolines and mini golf only a few minutes away. 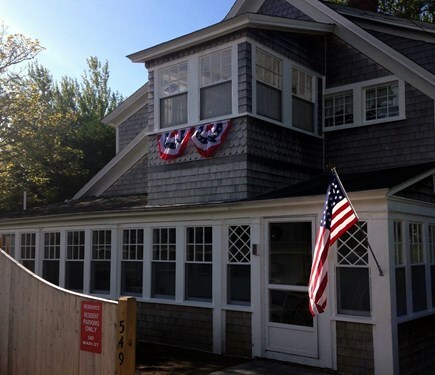 Harwich Port is centrally located being only a half hour to Hyannis, Brewster and Orleans and 10 minutes to Chatham.